Set of Principles | "The Voice of the European Services Sectors in International Trade"
Adopted on 26 January 1999. Updated on October 2008. 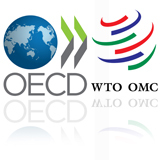 A new round of multilateral negotiations on services was launched at the Ministerial Meeting of the World Trade Organization (WTO) in November 2001. In 2006, the European Union has decided upon a new “Global Europe” trade strategy and to pursue regional and bilateral trade and investment agreements in parallel with multilateral efforts. Both the European Commission and the Member States have made clear repeatedly that they would welcome more contributions from business to international trade in services negotiations. To respond to this call, the EUROPEAN SERVICES FORUM (ESF) was created in April 1999 to provide business input for these negotiations and to work closely with the European negotiators as well as with similar counterparts in other countries which share the same objectives. The European Services Forum (ESF) is a network of high-level representatives from the European services sector committed to promoting actively the interests of European services and the liberalisation of services markets throughout the world in connection with all international trade in services negotiations, whether at multilateral, regional or bilateral level. World trade in commercial services, measured on a balance of payments basis, accounted for around one fifth of world exports of goods and services, and reached $2,7 trillion in 2006. Services account for more than 60%, or more than $420 billion of annual flows of foreign direct investment (FDI) in 2006. The services sector is a major source of innovation, and provides essential infrastructure and value-added investment for trade in goods. Services are also essential to improving economies of both industrialised and developing countries. The European Union, which is the world’s largest exporter of commercial services, accounting for 27,2% of total global services’ transactions (2006 – excl. intra EU 25), has a key interest in pushing for further trade in services liberalisation all around the world. But all other trading partners must be convinced that they have an equal interest in going along the same lines. ESF is determined to support and encourage the movement to liberalise service markets throughout the world and to remove trade and investment barriers for the European services sector, in particular in the fields of market access and national treatment. International trade in services agreements consist of further scheduling of commitments by trading partners in specific service sectors, including those represented in ESF. Trade in services negotiations are also an opportunity to improve the rules governing trade and to strengthen the place of services in international trade negotiations in general. 1. In the coming decades, issues related to international trade in services will present challenges to the multilateral trading system that at least equal, in importance and difficulty, tariff and non-tariff barriers to the development of trade in goods. 2. While bilateral and regional agreements and initiatives can play a useful supportive role, a firm and widely supported multilateral agreement remains the ultimate goal of services negotiations within the WTO. 3. Services and other services-related issues (such as investment and public procurement) should be negotiated in all international trade negotiations, with as much emphasis that the one given to trade in goods. go well beyond these standstills, in order to remove or reduce as far as possible barriers to trade and investment in all services sectors. Remaining impediments to substantially full market access and national treatment should be liberalised progressively on an agreed transition schedule. Particular attention should be paid to those services where, not enough progress has been made since the conclusion of the Uruguay Round signed in Marrakech in 1994. 5. The cross-border delivery of services in electronic form is of growing importance for many services sectors. Therefore, specific attention needs to be paid in the international trade in services negotiations to improving commitments which facilitate that mode of supply for all services sectors. 6. International trade in services negotiations should achieve greater liberalisation in all four modes of supply of services: cross-border supply, consumption abroad, commercial presence and presence of natural persons. 7. Close monitoring of countries’ ratification and implementation at all relevant part of trade agreements should be conducted. 8. Countries acceding to the WTO must make strong and comprehensive commitments to services liberalisation as part of their accession process. 10. Pro-competitive principles to rule-making should be developed, while preserving appropriate regulatory frameworks. 11. Political and public support for trade liberalisation in services sectors will require greater understanding of the benefits of trade liberalisation and the negotiating processes by which liberalisation is achieved. This set of principles may be reviewed and updated in the light of the discussions in Geneva and elsewhere. 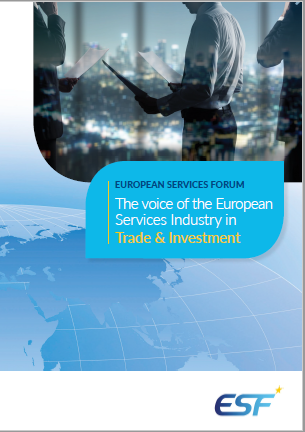 The European Services Forum is determined to work closely with the European institutions and their negotiators and to meet with services business representatives and officials from other trading partners with the view to building growing support for liberalisation of world trade in services. It will make regular assessments about the state of negotiations and will take its positions after comprehensive reports from the Commission.